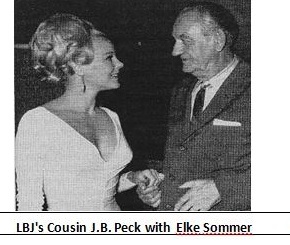 POSSIBLE corroboration for LBJ/ Younglood shenanigans 11/21-11/22/63? Page 264, based on Secret Service Agent Rufus Youngblood’s report in Volume 18, pages 681-682: Interestingly, while others slept or were out drinking in Fort Worth, Youngblood left in the early morning hours of 11/22/63, supposedly to visit a childhood acquaintance, a detail not mentioned in his LBJ Library oral history, his book, or anywhere else since he noted it in his report. 1 Response to POSSIBLE corroboration for LBJ/ Younglood shenanigans 11/21-11/22/63? Great stuff, Vince- as usual. I’ve been researching this case for over 40 years, and not much is new to me. This is.